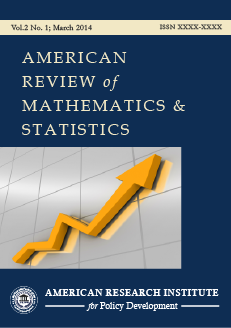 American Review of Mathematics and Statistics is a peer reviewed international scientific journal that publishes original and valuable research in all areas of applied and theoretical mathematics and statistics. The journal strives to strengthen connections between research and practice, so enhancing professional development and improving practice within the field of mathematics and statistics. Papers accepted for publication are double-blind refereed to ensure academic integrity. Each paper published in American Review of Mathematics and Statistics is assigned a DOI®number, which appears beneath the author's affiliation in the published paper. Click HERE to know what is DOI (Digital Object Identifier)? Click HERE to retrieve Digital Object Identifiers (DOIs) for journal articles, books, and chapters. Dr. Katya Georgieva Dishlieva, Faculty of Applied Mathematics and Informatics, Technical University of Sofia, Bulgaria. Prof. Fisenko Stanislav, Dept. of Mathematics and Informatics Department, Moscow State Linguistic University, Russia. Prof. Seifedine Kadry, Dept. of Mathematics, American University of the Middle East, Kuwait. Prof. Dr. Gloria Gempes, University of Mindanao, Philippines. Dr. Jiya Mohammed, Department of Statistics, Federal University of Technology, Nigeria.